I’m in the middle of a travel stretch – no blogging last Sunday because I was hardly at home, so I have two weeks of details. Since the last post, I’ve been to Indianapolis and had the opportunity to clock a fairly fast 4 miler with a friend of mine along the canal, early in the morning, before the sun came up. We had packed schedules, so 4 miles was all that would fit, but it was nice to get it in with so much sitting in meetings, airports, and airplanes. I got back late on Saturday, had a work commitment that evening, and was hoping to pull through a 16-20 miler on Sunday morning. No go. It was pouring torrents and I could only get through 7 miles. But, I needed the mileage, so I crammed in a long run, 14.5 miles, right before I had to get back to the airport for the next trip. 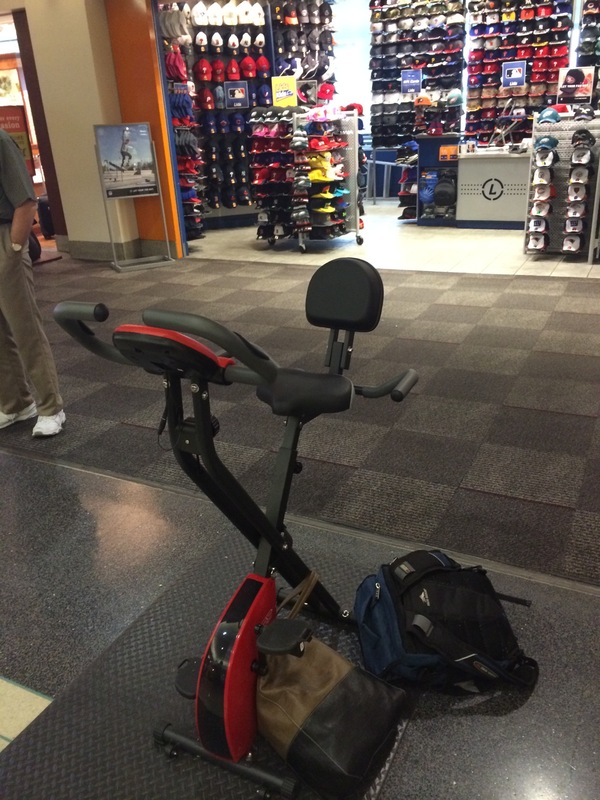 Yep – the airport had stationary bikes located throughout the terminal – for folks to just hop on and ride! No surprise, it wasn’t hard to find an “open” bike. The chairs were more popular. But, I hopped on and set the dial to a pretty insignificant tension level, and just happily moved my legs for about 20 minutes. Not really a workout because there was no need to get sweaty before cramming into a plane with a bunch of people, but it was nice not to be idle. I arrived in Minneapolis, late, and just went to bed. Still, I got up early enough to spend 30 mins on the treadmill (HATE the treadmill) before getting out the door for a full day of work. 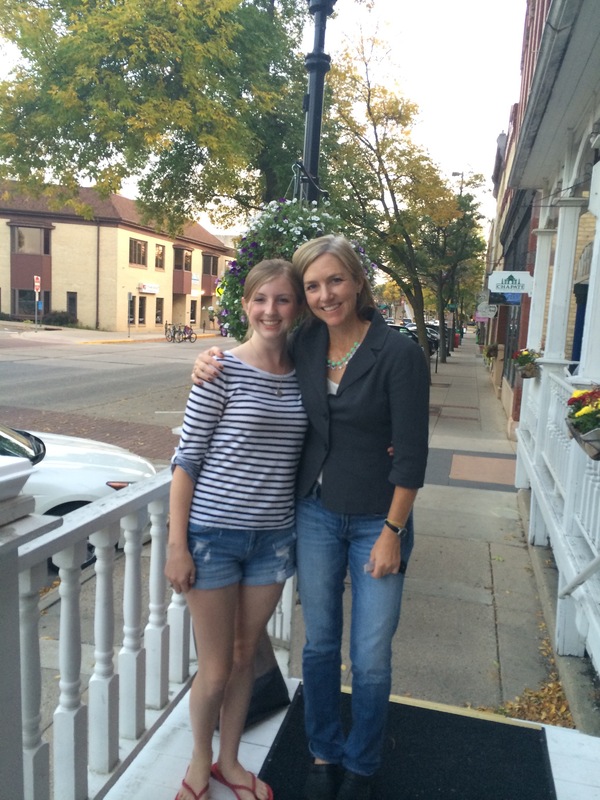 NOTE – at the end of my long day, I got to meet up with Lucy at Carleton College – great to see her, meet her roommate, and spend some time with them. Very happy! I ended up up having to switch hotels, and pretty much assumed I’d be back on the treadmill because this hotel is near the airport – all busy traffic all around. BUT, I saw a guy come in the lobby from a run as I was checking in and I asked him where he’d gone, and it turns out that there is a National Wildlife Refuge about 1.5 miles from the hotel! With miles and miles of beautiful trails! So, this morning, I ran out there, and into the refuge for the most beautiful scenery. 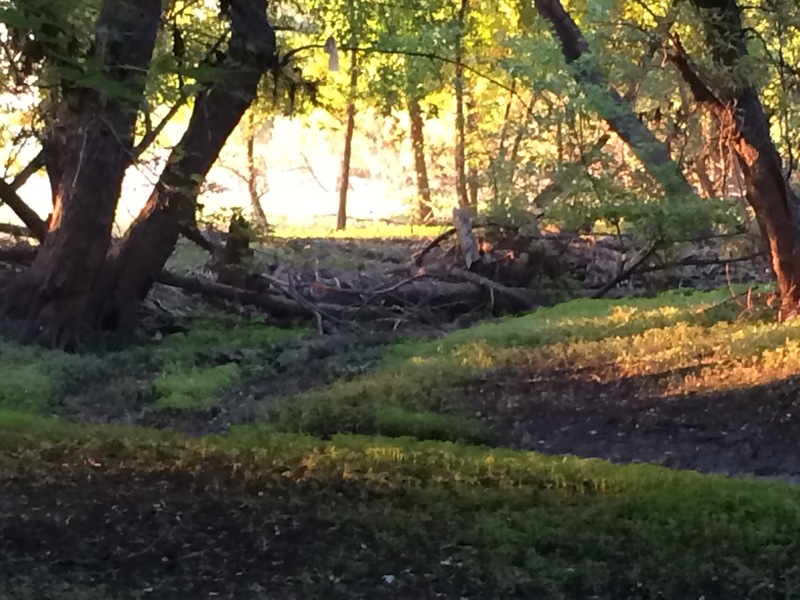 (And, there were other runners, dog walkers, photographers, and hikers, so it wasn’t too scary to be in the trails…) I managed 10 miles and it felt great – beautiful, cool in the shade of the trees, and just nice to get fresh air and move. So, the hassle of delayed flights in Philly and switching hotels in Minneapolis actually had an upside. Next weekend is the Maine Marathon or the Maine Half Marathon. I have to decide which I’ll do. 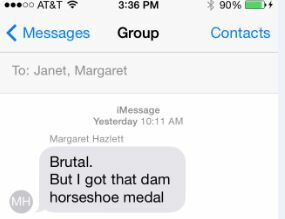 I signed up for the marathon before Janet, Margaret, and I decided on Philly. It’s a little early for me to grind through the full 26.2… but I have gotten some heavy mileage runs behind me already, so I might be able to do it. Or… I could save myself the trouble/stress/strain and just switch to the half and enjoy it. We’ll see. Marathon training is hard. It’s physically grueling, time consuming, and not even a necessary part of life. Everyone who does it has their own reasons and I have mine. But, whatever the reasons, the mileage stays the same and everyone training for a marathon has to figure out how to press on – or not. I took 2 days off after my long run last weekend. I did lunges, squats, kettlebell, and the BodyBlade. And longish walks with my dog, Stella. But nothing that was really very difficult. I was resting. When I went out for some mileage on Wednesday morning, I was struck by how bad I felt, and realized that’s almost always how I feel when I step off the driveway for a run. I noticed tightness in my calves, a strain in my foot, a knot in my right shoulder blade, and just overall fatigue. In the first mile, I thought, “I need to listen to my body – it says it’s tired, this is too much, I should back off.” But, I also remembered that I usually feel better somewhere between 2-3 miles. The first mile isn’t a good gauge. The first mile is just a succession of whiny fake out excuses. I kept going and told my mind to think about other things besides aches and pains and before I knew it, I was cruising through the 4th mile, warmed up, breathing easily, with a steady cadence, … and comfortable. I realized that it’s much like other things in life – when faced with discomfort, don’t give up. Check it out. Check in with that discomfort. Try it on for a while. See if you can move through it and get comfortable. Because if you can move through it, you might be able to keep moving and cover a lot of ground. But, then again, sometimes you can’t. Like, last weekend when my IT band got into a fight with my knee and there was no “running through it.” There was only stopping. 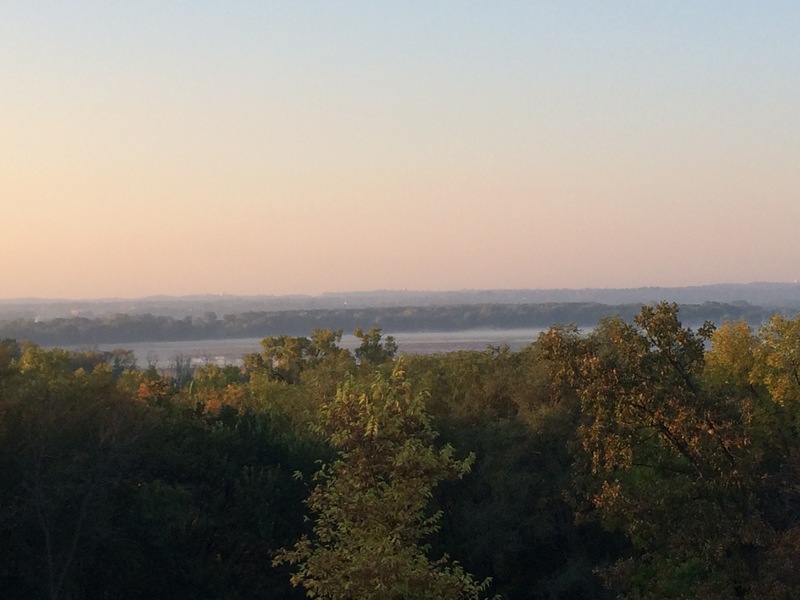 But I had a goal this week – I wanted to get past that 18 mile mark that has been eluding me. So, I used that goal as my focus – and I made time to use the roller twice a day, to roll out my feet, to stretch my hamstrings and my hips. And went to a massage therapist (HEAVEN) to really try to loosen up all that tightness. I wanted that 18 miles. Because Julie freed me up to run for an hour, I had a chance to test out my bod after all that therapy work and I was feeling good – feeling like maybe I could get to the 18 this weekend. As I mentioned in my post last week, friendship is an amazing thing. In Julie’s company, I started to feel better physically, I laughed a lot. 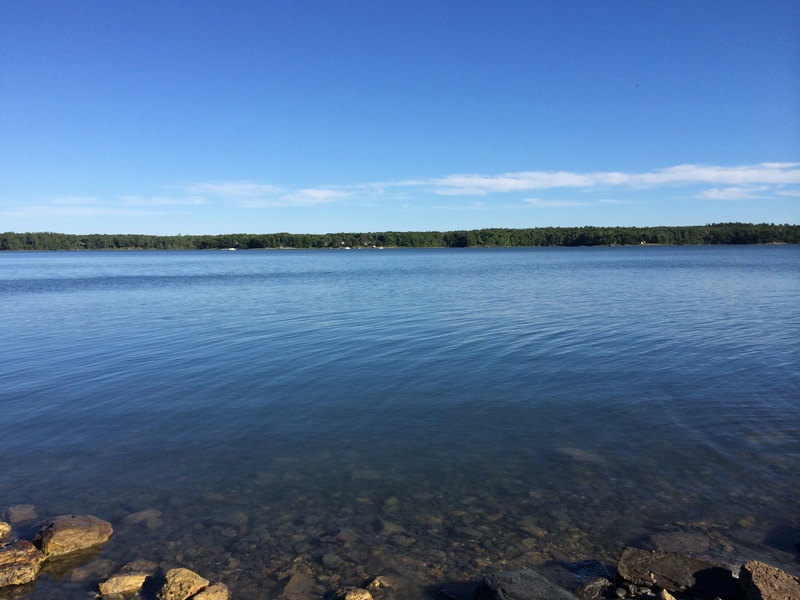 We also quietly hung out on the coast near my house and I appreciated the peace of watching the water and giggling at the clams that were spitting at us on the shoreline. As an aside, one example of how Julie is the greatest kind of friend is how much she loves my dog, Stella. 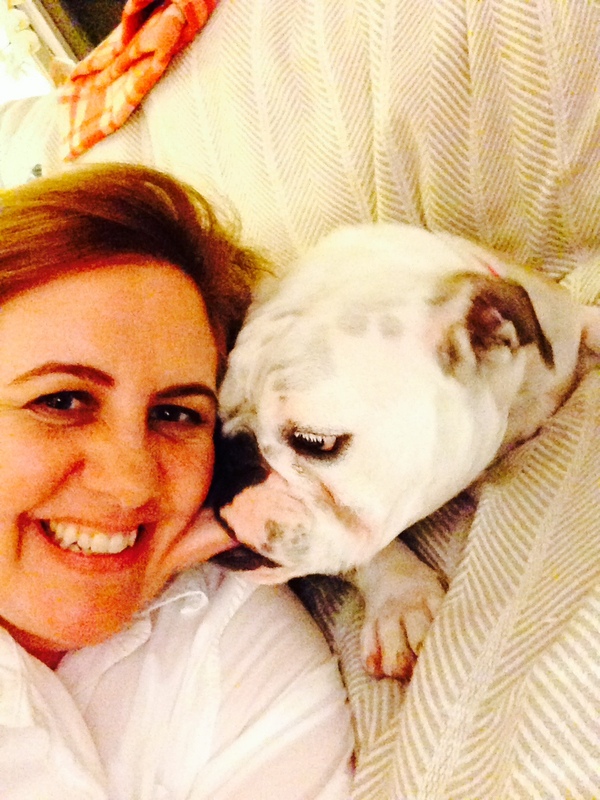 I mean, really, who takes selfies of themselves with someone else’s dog? And lets that dog lick her face?? Julie had to leave me and head back to NYC, but she left me lifted up, leaving me energized, and feeling ready to go after that damn 18 miles. 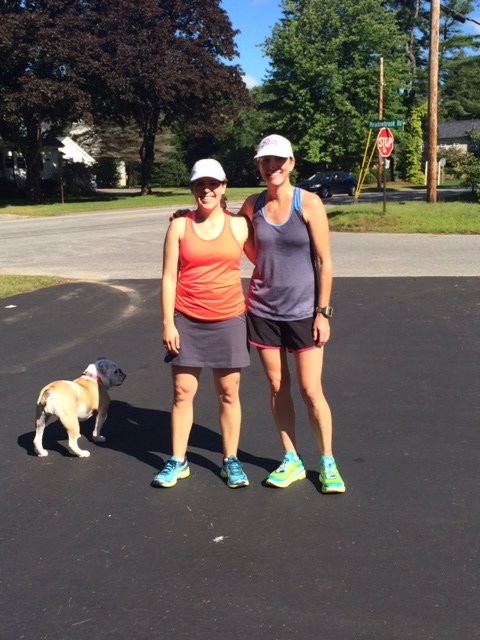 Janet couldn’t run with me this weekend because she was busy going to pick up her new dog! But, Kat was good for 8 miles and was happy to put her 8 into my challenge. So, I ran 5 on my own, picked up Kat in my driveway for the next 8. We kept a steady pace, slow enough that we could talk and catch up. It was really slow for Kat, but she kindly matched my steps instead of leading me into a faster pace that I wouldn’t be able to sustain. After we finished the 8 mile loop, I had 13 miles behind me and continued on to get the next 5. Usually I need music for long mileage because it helps me keep pace when I get really tired. But, since I had been with Kat, I didn’t have music with me, so I had to soldier into that last stretch without any assistance. I had moments of thinking, “I should stop now before my knee hurts” but it wasn’t hurting, so I kept trotting along. I realized that I might be able to get to 20 miles. 1. I wanted to stop, for real, before my knee hurt. It was so stunning to me that I had made it that far without the knee acting up that I really didn’t want to make it happen. 2. Mile 19 was at my house. For me to get to 20 miles, I would have had to run PAST my house, which was just really hard to do when I had already gone 19. So, the 19 seemed good. I stopped. I was happy. 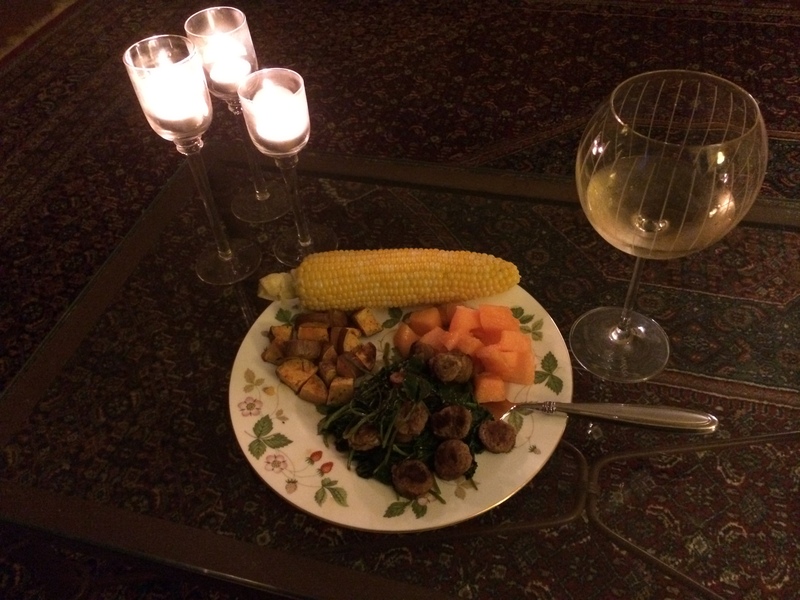 For dinner, I made this tasty plate of sauteed turkey sausage and kale, melon, corn, and roasted sweet potatoes. And, just in case you think I’m all righteous with my healthy eating, I finished off the meal with a bowl of ice cream the size of a melon. The size of a watermelon, specifically. Dee-lish. I have much travel coming up in the next couple of weeks, so I need to figure out how to get the mileage in. Part 1: Last Sunday, I ran 16 miles. During the week, I was supposed to run a 2mi day, then a 6 mile day embedded with 4 miles of “speedwork.” The day that I set out for 2 miles, I got lost and had 5 miles on the books by the time I made it home (and late for work.) So, the next run, I thought I’d just do 3 miles and do “speedwork” – which, according to the training plan, is back to back miles at a rate faster than I’ve run before. I hadn’t gotten close to that pace yet, and I hadn’t even really tried. On “speed” days, I was just running faster than I normally do. Part 2: One of the guys who joined the College last year as a Senior VP is a very fit guy. He’s run a couple marathons and I think has established some pretty nice finishes at triathalons. Now that I’ve moved, I live within a couple miles of his house. I’ve seen him and his wife (also a very fit individual) go by on their bikes from time to time and they are not just “cruising.” They are racing. I met him a social event last year before the marathon and he graciously gave me some good tips and lots of encouragement. Now that we work at the same place, we bump into each other occasionally and he’s always inquired about my running plans and goals, which is very nice. Collision Parts 1 & 2: So, since I covered 5 miles earlier in the week, I started out on Thursday morning to try a short speed distance. 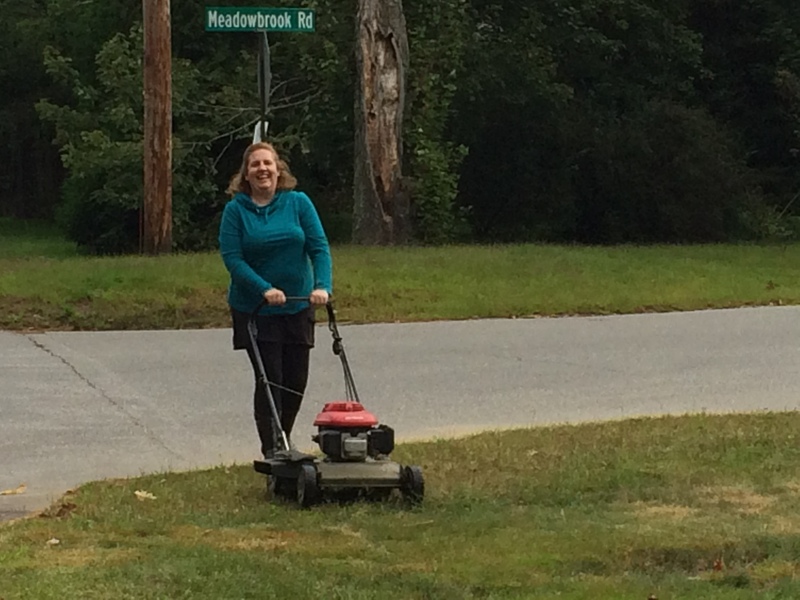 My goal – 3 miles as fast as I could go. I was determined and focused and was trying to run as efficiently and fast as possible to see how fast I could really be. (I have never tried this before – EVER.) So, I had one mile left and I was really moving – I was actually running at the training plan goal pace. I was thinking to myself, “Wow – too bad I’m alone when this is happening!” Next thing I know, a guy goes by on his bike and yells out “Hey Whit!” but he’s past me before I get a good look. Today, I was aiming for 18 miles. Janet and I had a plan to break the mileage into loops and a friend from work, Kat, planned to join in for final 8 mile loop. Janet and I had a really nice 10 miles at a nice pace where we could actually chat with each other for the first 7 miles, and tried a new road on the route that was really, really pretty! Kat kicked in at mile 1o to pace me for the next 8 miles, which was great. I was already tired, but she was just getting started, so she had good energy and stayed with me, also chatting, making the mileage easier to take. My daughter, Lucy, drove by in the car at mile 14 to check on us, see if anyone needed a ride home, and offer ice water. I assured her I could make it home, gulped the water, and waved her off. At mile 14.5, my left knee got mad and stopped doing its part. It was complaining non-stop, causing a left-listing shuffle that then caused a side-stitch on the right. Lucy was long gone. I had 3.5 miles left. Kat switched up the route to get us onto a dirt road instead of pavement, but I was still hurting. All in all, I made it to 16.93 miles. Not 18. Not quite the 17, but close enough that I’m putting “17” in my training log. And I don’t think I could have gotten that far on my own. This is why friends are so great! When things get tough, friends can make it feel less tough, and even figure out a way to lessen the challenge. Friends are awesome. Here we are in my driveway (Kat -left, me -right.) Phew. Yep. She probably won her age-group, too.